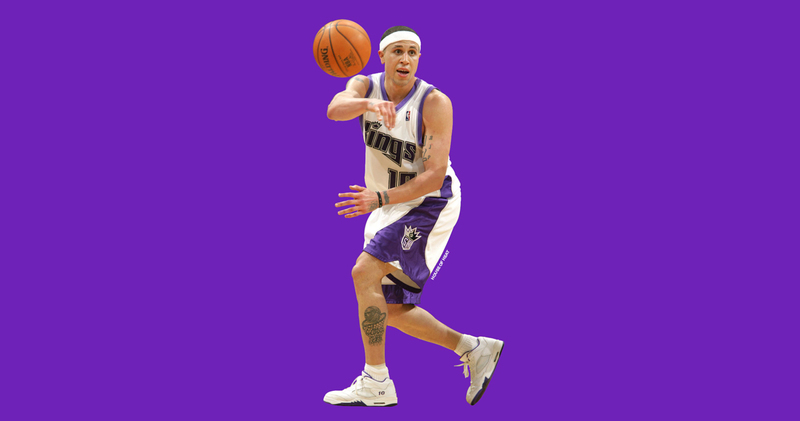 In case you missed it around the ‘gram, Mike Bibby has beefed up. The 40 year old, 14-year NBA veteren took to IG to post a post-workout shot with his son, Michael Bibby, and the net went wild. But when it comes to Bib, there’s one thing that’s never needed beefing up — his Air Jordan collection. After balling out it in the Foamposite One for the 1997 NCAA championships, we just knew Bib was going to establish himself as one of the Hall of Fame sneakerheads when he hit the NBA the next year. Not only did this dude go first ballot, he declared himself the GOAT. And he could back it up, too. There’s plenty of guys out there, both in the league and on the street, with boxes upon boxes of exclusive and rare heat. Getting these guys to ball in them is one thing (a rare thing in itself), let alone dropping buckets and balling out in them. And if you’re gonna lace up some serious heat, you’ve gotta be able to seriously hoop. And that he did. His 14-year career was stacked with iconic clutch shots and a killer-instinct attitude that should have taken the Kings to the NBA Finals in 2002, if it wasn’t for the unfortunate (some say rigged) officiating in Game 6 of the WCF agains t the Lakers. During those 14 years, he amassed the most envious PE collection in Jordan history. His time with Vancouver, Sacremento, Atlanta, Washington, Miami and the Knicks enabled the the point guard to pick up PE’s in almost ever colorway imaginable, most arriving in Low forms that we’d never seen before, and almost always finished with his name, number or both. Mike is one of the original members of Team Jordan, and, to this day, still gets the hook-up from Oregon. It was this post of his sneaker closet yesterday that inspired us to share (some of, believe me, there’s plenty) his greatest Jordan Brand moments from Mike’s playing days. Be sure to tell us which your favorite pair is in the comments section below!